Born in Covington, Ky., in 1942, Jack Ernest Roush was always interested in finding out what made things tick. He received his mathematics degree with a minor in physics from Berea College in 1964 and moved to Detroit to go to work for Ford Motor Company that same year. He went on to earn his Master’s Degree in Mathematics from Eastern Michigan University in 1970. While working for Ford, Roush was drawn to the company’s extensive motorsports activities, and in 1966 joined a group of fellow racing enthusiasts called “The Fastbacks.” After leaving Ford, he partnered with Wayne Gapp in 1971 in a racing venture that would see the duo attract national attention by winning numerous national events and one championship each in NHRA, IHRA and AHRA with their Pro Stock race cars. In 1976, Roush formed Jack Roush Performance Engineering. His success on the track, combined with his reputation as a performance engineer helped his young business thrive, and although he stopped operating a race team in the late 1970’s, his company stayed well entrenched in the sport; building engines for other teams into the present day. In 1981 Jack formed Zakspeed-Roush, a partnership with German touring car team owner Eric Zakowski. In the months that followed the team, in conjuction with Ford Aerospace, constructed a carbon fiber-tubbed IMSA GTP Mustang that won its first outing at Road America. In 1984 Roush formed his own team, Roush-Protofab, to compete in the Sports Car Club of America (SCCA). In the years that followed he additionally competed in International Motor Sports Association (IMSA) road racing series. He went on to claim 24 national championships and titles in the two series, including 12 manufacturer’s championships, winning 119 races, while working with acclaimed drivers such as Tommy Kendall, Scott Pruett and Willy T. Ribbs. Roush also captured 10 consecutive sedan class championships at the prestigious 24 Hours of Daytona, teaming with drivers such as Kendall, Pruett, Mark Martin, Bill Elliot, Ricky Rudd and Kyle Petty, as well as actor Paul Newman and Olympic star Bruce Jenner. In 1988 Roush decided to expand his racing operations south and join the fray in the expanding world of NASCAR. Already an accomplished drag and road racer, NASCAR was exciting but uncharted territory for the former Ford engineer and college physics teacher. He launched his first NASCAR Cup team with driver Mark Martin. In October 1989, Roush and Martin claimed their first NASCAR Cup victory at North Carolina Motor Speedway, the first of 121 for Roush NASCAR Cup teams to date. The two would go on to form one of the most successful partnerships in NASCAR history. The move into NASCAR proved a success and more than 30 years later, Roush has built his team into one of the most successful in all of professional sports. Roush joined forces with Robert and Doug Yates to form Roush Yates Engines in 2003. The engine shops, based out of Mooresville, N.C., supply horsepower for Roush Fenway Racing, Front Row Motorsports and all Ford teams in NASCAR’s Monster Energy Cup, Xfinity, and Camping World Trucks. In 2007, Roush Racing and Fenway Sports Group (FSG) announced the formation of Roush Fenway Racing, an unprecedented relationship that brought together two championship organizations with a distinguished record of success in their respective businesses and sports. Roush’s teams have captured multiple championships, across all three of NASCAR’s major platforms, while taking home 325 checkered flags in the process. Today, Roush Fenway stands as the winningest team in NASCAR history, boasting both and the most wins overall across NASCAR’s top-3 touring series, and the most wins in the NASCAR Xfinity series. The direct result of Roush’s hard work, drive and determination has parlayed into more than 1000 top fives and over 2000 top 10s, while leading over 57,000 laps and turning well over a million miles. In total, Roush has won eight championships across NASCAR’s three premier series (2000 – Truck Series with Greg Biffle; 2002 – Nationwide Series with Greg Biffle; 2007 – Nationwide Series with Carl Edwards; 2011 Nationwide Series with Ricky Stenhouse Jr. (No. 60 owner); 2003 – Sprint Cup Series with Matt Kenseth; 2012 Nationwide Series with Ricky Stenhouse Jr., and 2004 – Sprint Cup Series with Kurt Busch, and most recently with the 2015 Xfinity Series with Chris Beuscher) In 2009, Roush claimed his first Daytona 500 trophy in February and his 2,500th Sprint Cup start in June of that same year. In 2010 Roush Fenway Racing turned its one millionth mile in NASCAR’s Sprint Cup series. In 2017 he captured his 137th Cup victory. All in all, 19 different drivers have driven Roush Fenway equipment to NASCAR victory lane, of those 9 won in Cup series competition and 8 earned their first Cup victory. He was first nominated for the NASCAR Hall of Fame in 2016, and was voted into it as part of the class of 2019, with the induction happening in a ceremony scheduled for February 1, 2019. For more than 50 years Roush has been committed to winning on and off the track. Having won 32 championships and more than 512 races in drag racing, sports car and stock car racing, Roush is one of professional sports’ premiere owners. With championships in NASCAR’s top three divisions, Roush Fenway Racing exemplifies tradition and success and is poised to continue their winning tradition well into the future. 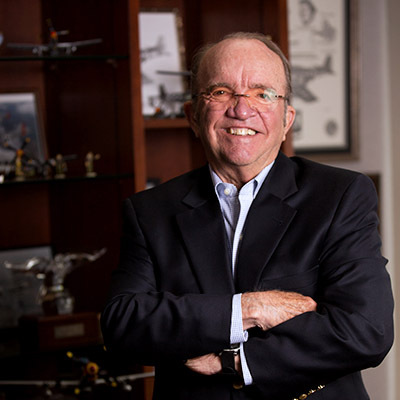 Roush is also chairman of the board of Roush Enterprises, Inc., which employs more than 5,000 people and operates more than 50 facilities across North America, Europe, and Asia. Although primarily known for providing engineering, prototyping, testing, and prototype services to the transportation industry, Roush has developed a significant role in providing engineering and manufacturing for the theme park, defense, aerospace, and oil and gas production industries.